Welding creates a serious challenge to visual acuity. The light emitted from gas and arc welding is intense, and contains high levels of both UV and IR light in wavelengths harmful to the human eye. For this reason, welders (myself included) wear helmets and goggles that utilize filters to reduce brightness, strip away the harmful wavelengths, and protect us physically from welding splatter, which is very nasty. Unfortunately this seriously compromises visibility of the welding task and its surrounding. While the arc itself illuminates the surrounding, the contrast between the arc itself and the area around it is so great that this affords little clarity. When smoke and splatter are included, most welding is done within a very poor visual field. In some case, it is done almost completely blind. 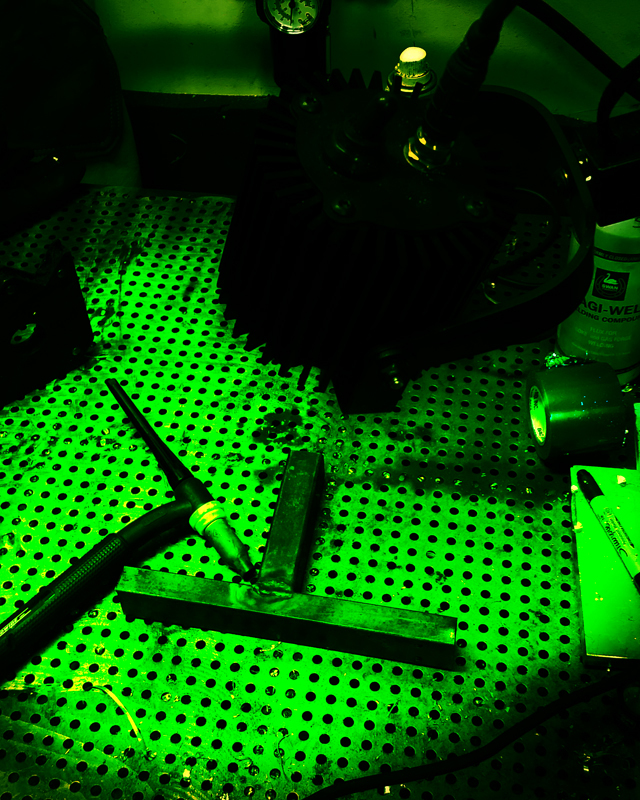 The concept is to use narrow spectrum green light, in this case 530nm Green, to more efficiently deliver visible light through welding glass filters. This increases intensity in the area of the task. It is very difficult to photograph exactly what one sees through the darkened welding glass, and impossible when an arc has been struck. Most welding glass passes light in a narrow green centered bandwidth, which is why the view through them is green, to the point of being monochromatic. That means most of the light from any task light used that generates white light will be filtered out along with the welding arc emission. That seems inefficient and reduces the effectiveness of the lighting system to the point of being essentially useless. 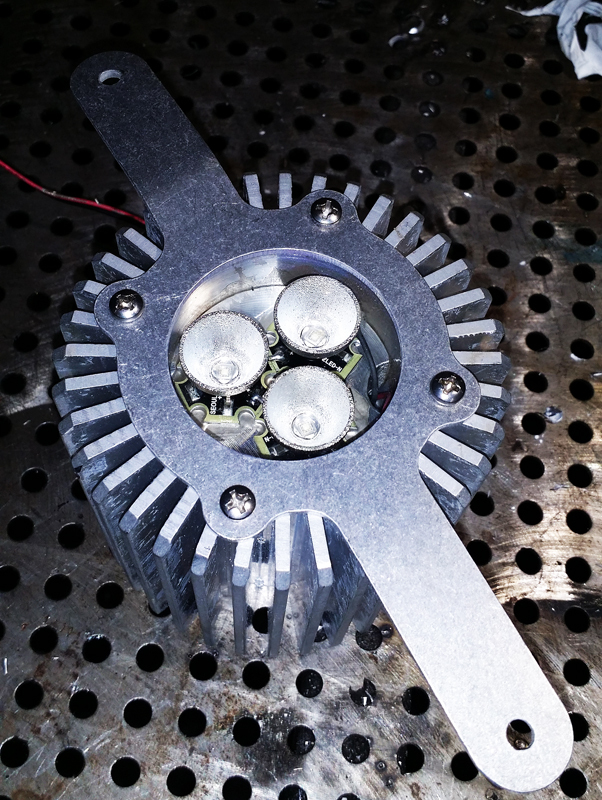 An early test mule using three 5W green LEDs and medium narrow optics to create intensity. This is a work in process. However, so far, with the same energy applied to an identical white light source, vs. a green light source, the amount of brightness visible through the welding glass is doubled. The early test mule (shown in the image above), utilized optical reflectors to intensify the beam pattern. I was hoping to amplify the effect of the focused task light into the visual welding field. This actually proved to be less useful than it might look, due to the creation of harsh shadows from the welding gun or torch, so later models have reverted to a more diffused, softer beam pattern, which reduces these effects. LEDs act like low efficiency photo-voltaic sources when exposed to high intensity light. This creates voltage back into the driver during welding work. For the most part, this is not an issue. However, with a few drivers I have employed, this effect causes internal failures (not fully explained). I isolated the voltage from the welding area, electromagnetic effects, and all other factors, before testing the theory that some drivers cannot deal with this by applying a small external voltage to them in operation, which duplicated the failure mode. Now I test all drivers under a welding arc, on aluminum and steel substrate (each emit a different spectral power state), to insure this does not create undesirable results. When gas welding under the green light, I find the appearance of the flame kernel (main heat source) more pronounced, which appears to be from the increased intensity of the surrounding field. This is a happy development, as it increases visibility of the location of that heat source to the weld zone. There is also an enhancement of the colors seen in the weld pool to a small degree I am working toward intensifying further. I will be working on this more as time passes, so will update this entry as new discoveries are found. Ideally, working with a welding glass producer to create an idealized combination of glass filer and light source, coupled with a hood manufacturer to mount the light in the welding hood itself, activated by the arc itself would create an even more interesting result. The next phase for me is to prototype such an animal for my own use. Stay tuned.